Oligopoly is a common economic system in today's society. 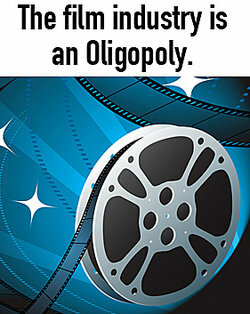 The word "oligopoly" comes from the Greek "oligos" meaning "little or small" and "polein" meaning "to sell." When "oligos" is used in the plural, it means "few." Oligopoly is the middle ground between monopoly and capitalism. An oligopoly is a small group of businesses, two or more, that control the market for a certain product or service. This gives these businesses huge influence over price and other aspects of the market. Since it is the middle ground, oligopoly examples are abundant in our economic system today. A monopoly is exclusive control of the market by one business because there is no other group selling the product or offering the service. A true monopoly rarely exists because if there is no competition, business will increase the price while reducing output to increase profits. Antitrust laws keep this type of market condition from existing. A "natural monopoly" exists where having more than one supplier is inefficient, like in public utilities, but these are regulated by the government. Not only does a monopoly cause higher prices; it can also lead to inferior products and services. Capitalism is a condition where there is open competition, a free market, and private ownership of production. This encourages private businesses and investments, as compared to a government-run system. With capitalism, the market is regulated through the dictates of supply and demand, price, and distribution which are controlled by business owners and investors. Profits are distributed among the owners and shareholders; these shareholders in private companies are called capitalists. They are less concentrated than in a monopoly, but more concentrated than in a competitive system. There is still competition within an oligopoly, as in the case of airlines. Airlines match competitor's air fares when sharing the same routes. Also, automobile companies compete in the fall as the new models come out. One will reduce financing rates and the others will follow suit. The businesses offer an identical product or services. This creates a high amount of interdependence which encourages competition in non price-related areas, like advertising and packaging. The tobacco companies, soft drink companies, and airlines are examples of an imperfect oligopoly. Pro: Prices in an oligopoly are usually lower than in a monopoly, but higher than it would be in a competitive market. Pro: Prices tend to remain stable because if one company lowers the price too much, then the others will do the same. The result lowers the profit margin for all the companies, but is great for the consumer. Con: Output would be less than in a competitive market and more than in a monopoly. Most competition between companies in an oligopoly is by means of research and development (or innovation), location, packaging, marketing, and the production of a product that is slightly different than the other company makes. Con: Major barriers keep companies from joining oligopolies. The major barriers are economies of scale, access to technology, patents, and actions of the businesses in the oligopoly. Barriers can also be imposed by the government, such as limiting the number of licenses that are issued. Con: Oligopolies develop in industries that require a large sum of money to start. Existing companies in oligopolies discourage new companies because of exclusive access to resources or patented processes, cost advantages as the result of mass production, and the cost of convincing consumers to try a new product. Lastly, companies in oligopolies establish exclusive dealerships, have agreements to get lower prices from suppliers, and lower prices with the intention of keeping new companies out. "Oligopoly Examples." YourDictionary, n.d. Web. 23 April 2019. <https://examples.yourdictionary.com/oligopoly-examples.html>.